The Brockmann Recycling team relies on a large fleet of highly specialized equipment to handle the everyday demands of its operation. Handling material that contains nails, screws and jagged metal can certainly have an impact on equipment tires. According to Brockmann Recycling officials, having the right tires is crucial for avoiding downtime. At their facility many equipment “standard” tires were not performing as well as they would have liked them too — especially in the unique application they are using a MAN TGS 26.400 truck on. Brockmann Recycling customized the 3-axle MAN TGS truck to handle heavy containers at the recycling facility. While transporting these containers, the truck is often exposed to jagged ground debris. 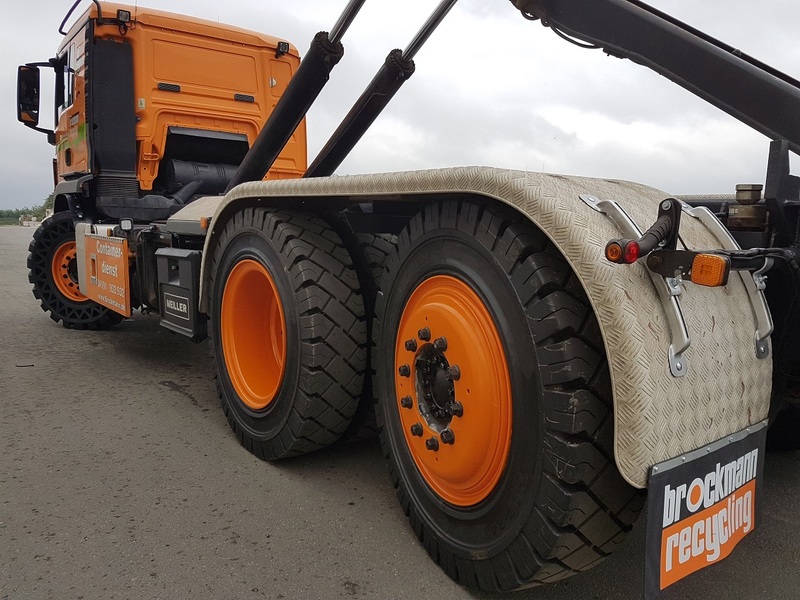 When using pneumatic tires, Brockmann Recycling had issues with tire punctures, which led to a significant amount of downtime for the 3-axle truck. Unhappy with their current tires performance, the Brockmann Recycling team enlisted the expert advice from Camso. Representatives from Camso met with the team at Brockmann Recycling to discuss their tire needs and the challenges they were experienced with their current tires on the MAN TGS truck. With a global team that continually meets with company owners, fleet managers and operators, Camso understands that many applications demand more than what a standard equipment tire can offer. This is why, Camso offers customers custom made solutions for specific applications and machines. The local Camso representative analyzed the situation and discussed with the Brockmann Recycling team their desired outcome; they needed a high-performance tire solution that would not fail in the sorting plant’s harsh operating environment while providing excellent ride comfort. However, the disc brakes size and location on the first axle of the MAN TGS truck inhibited standard options like using 20” resilient tires. With the support of the rest of the Camso team and their expertise in the tire and wheel business, the local representative was able to offer Brockmann Recycling a tire solution that would excel in this specific application, and manufacture a set of custom wheels at the Camso wheel facility in Germany. Limited by the position of the front disc brakes, Camso recommended the new MPT 793S 375/85-24 tire model for the front axle. 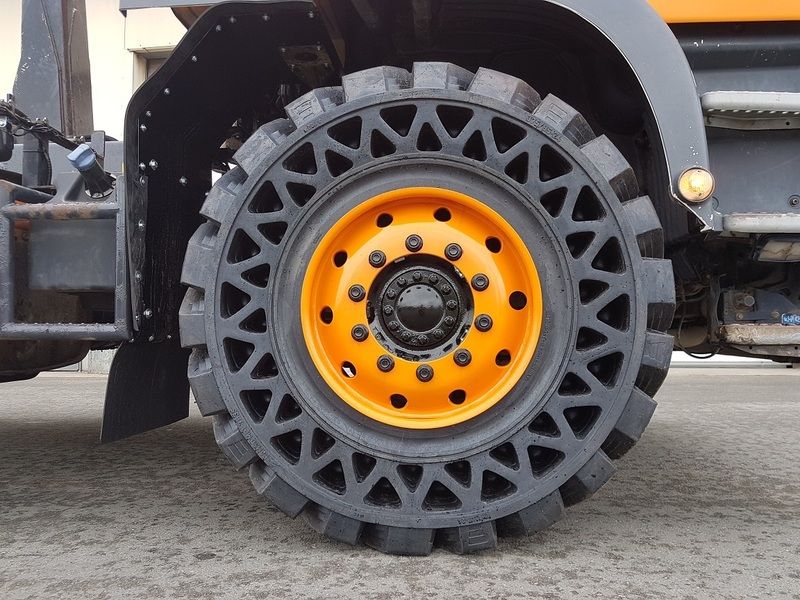 This tire is the first and only flat-free solution purpose-built for multipurpose machines to maximize uptime in severe conditions. It has a triangular aperture design that provides excellent stability and ride-quality. On both the load and steerable lift axles, Camso suggested using the Solideal RES 660 12.00-24 Xtreme Series — a resilient tire that is usually used on forklifts. The tires’ dimensions were the same as the trucks original tires, provided operator comfort and are puncture proof. 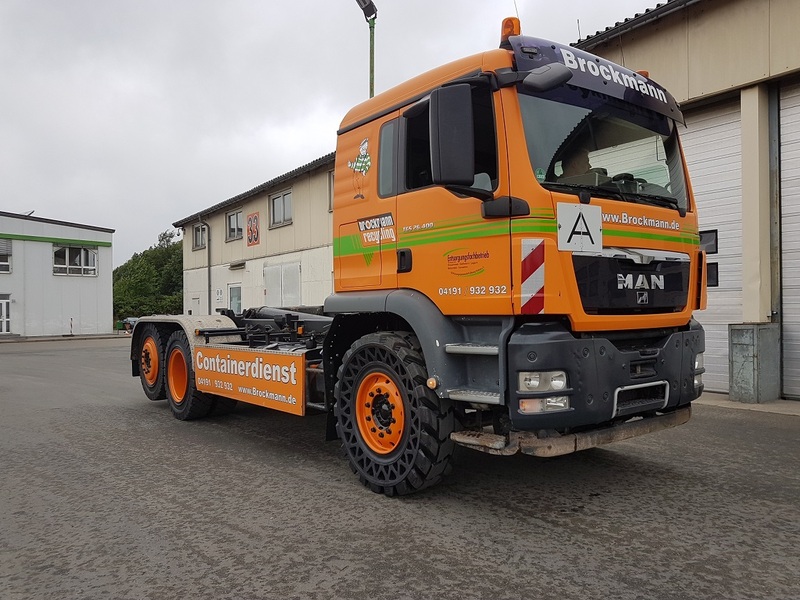 While many organizations may not consider using tires typically found on forklifts for a truck, this configuration is proving to be the right solution for Brockmann Recycling’s MAN TGS truck. The Camso and Solideal tires provide the right balance of traction, stability and ride performance for this specialized application. For more information about Camso MPT 793S and Solideal RES 660 tires, consult your local Camso representative or visit camso.co.